AP reporters allegedly spied on by the Justice Department aren't alone. On Monday, the Associated Press revealed that some of its reporters were recently spied on by the Justice Department in what it called a “massive and unprecedented intrusion.” The feds secretly obtained AP journalists’ phone records as part of what is believed to be an ongoing investigation into leaks of classified information. But it’s not the first time U.S. authorities have adopted draconian surveillance tactics to uncover journalists’ confidential sources. The AP incident involved the DoJ obtaining two months of reporters’ phone records, which listed outgoing calls for the work and personal phone numbers of AP journalists and editors. AP said in a report published Monday that it was not clear whether the records also included incoming calls or the duration of the calls, but noted that “the government seized the records for more than 20 separate telephone lines assigned to AP and its journalists in April and May of 2012.” The DoJ’s investigation is thought to be linked to an ongoing criminal investigation that is attempting to track down the source of leaks that led to a May 2012 scoop about a foiled terror plot planned by so-called “underpants bomber” Umar Farouk Abdulmutallab. Typically, phone records obtained by the feds will show date, time, and duration of incoming and outgoing calls and/or text messages, according to the ACLU. While the data do not reveal the actual content of a call, they can be used to show a network of contacts and reveal relationships between people—information that is particularly sensitive for journalists working with confidential sources. The feds can input the records into a database before analyzing them using investigative software like the “i2 Analyst’s Notebook,” a popular law enforcement tool sold by IBM. The raw phone records data can be transformed into detailed interactive charts that map out links between people. A few examples of what these charts look like can be found here, here, and here. In recent years, however, the FBI has flagrantly disregarded these rules on multiple occasions. A scathing 2010 review by the DoJ’s inspector general criticized how the feds had spied on Washington Post and New York Times reporters in a leaks investigation carried out in 2004. The feds obtained 22 months of reporters’ phone records “without any legal process or Attorney General approval,” the inspector found, which illustrated “the absence of internal controls” and was judged to be “negligent in various respects.” The same report detailed two other cases of the FBI obtaining reporters’ phone records without following the proper procedures. One of these cases was described as “deficient and troubling” and the other a “clear abuse of authority” that violated the Electronic Communication Privacy Act, federal regulation, and DoJ policy. The legality of the feds’ latest snooping on journalists is already being called into question. AP President Gary Pruitt wrote a furious letter to Attorney General Eric Holder on Monday, demanding that the authorities “destroy all copies” of the records on AP reporters. Pruitt described the investigation as “a serious interference with AP’s constitutional rights to gather and report the news” and said there was “no possible justification” for the intrusion. 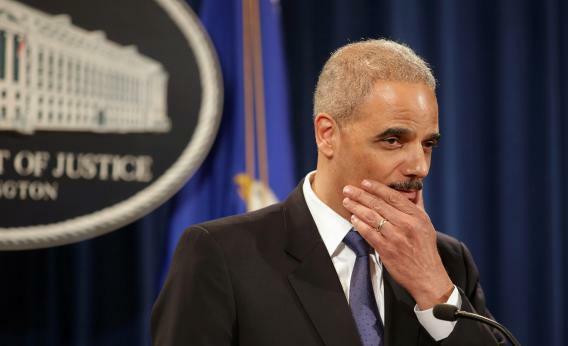 Holder can expect to face a grilling on the matter Wednesday afternoon, when he is coincidentally scheduled to appear before a DoJ oversight hearing being held by the House Judiciary Committee. It’s worth noting that the debacle comes amid an unprecedented wider crackdown on leaks instigated by the Obama administration’s DoJ, which has so far prosecuted more whistleblowers under the Espionage Act than all previous administrations combined. The targeting of AP journalists’ phone records to reveal confidential sources, like the ongoing criminal investigation into WikiLeaks for its publishing work, will stand as another egregious example of disproportionate action taken by a government attempting to assert its authority over state secrets like a high school bully on steroids. “The fact is I really do respect the press,” Obama said late last month in a speech at the White House correspondents’ dinner. But so long as his administration continues to target whistleblowers and reporters, those words will ring hollow.